The Internet of Things – frequently referred to as “IoT” or the “Internet of Everything” – is a hot topic in the world of business and facility operations, and with the ongoing advances of the IoT technology and it’s ever increasing ubiquity in our day-to-day lives, there appears to be no shortage of the potential applications for IoT in the cleaning industry. While IoT technology is still in the early stages when it comes to complete integration into the day-to-day operations of the cleaning industry, there are already several applications of note, with more on the way in the near future. If the Internet 1.0 helped connect people to computing devices (think static websites which convey information but do not provide the opportunity to be interactive), and if the Internet 2.0 helped connect people to other people via these computing devices (think social media which allows people to connect with other people and share ideas and opinions), then the Internet 3.0 is going to help connect the computing devices with other computing devices (think “smart” appliances which have the ability to communicate their status to other connected computing devices in order to provide updates and improve performance). In short, the IoT can be described as the next evolution of the internet, where devices are connected in order to collect and communicate data to allow for them to potentially enhance productivity and increase user satisfaction. So how is IoT being integrated into the cleaning industry? WAXIE has offered the Bigbelly smart waste and recycling collection system since 2008, with numerous successful deployments throughout the Western United States. The basic premise of the Bigbelly is that the system collects waste and recyclables and then utilizes solar energy to power compaction in place along with IoT communication of fullness status and collection history in order to reduce the labor costs associated with checking and emptying waste and recycling bins and enhance productivity. 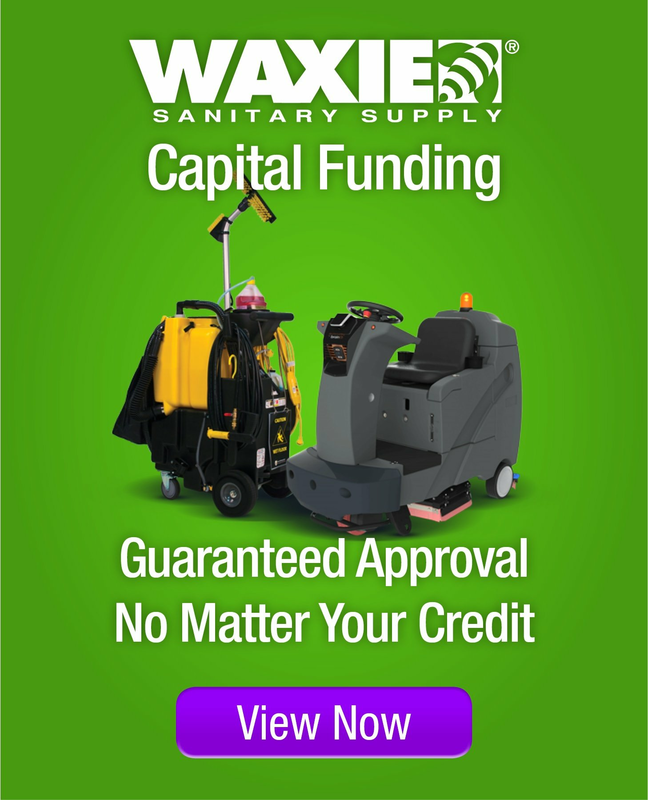 WAXIE has offered the Intellibot automated hands free floor care robots since 2016, with several successful deployments throughout the Western United States. The basic premise of the Intellibot is that the robots can perform predictable and repeatable floor cleaning tasks in order to reduce the labor costs associated with operating floor care cleaning equipment while also freeing up time for the cleaning workers who would usually be required to operate the equipment to instead complete other cleaning tasks and inspections. In addition, there are several other robotic options coming into the market to offer this laborsaving solution, and IoT connectivity is an integral component of these solutions. WAXIE has offered equipment fleet management from a variety of equipment vendors since 2015, with several successful deployments throughout the Western United States. The basic premise of fleet management is that the cleaning equipment uses IoT technology to communicate via any internet-connected device, allowing the operator to be able to ascertain the location, usage history and current performance status of the equipment fleet in order to more effectively manage cleaning operations. WAXIE has offered smart restroom systems since 2016, with a handful of pilot deployments so far. The basic premise of a smart restroom is that dispensers in restrooms are able to use IoT technology to communicate fullness status and usage, which allows for cleaning workers to proactively anticipate if a dispenser may be running low so that it can be refilled before it runs out. And since the dispenser will also communicate historical usage data, future needs can also be more accurately anticipated and addressed. Who knows what the future will hold, and what new devices will be connected via the IoT – and who knows how these current connected options will continue to evolve and improve. Only time will tell – one thing that is certain is that WAXIE will continue to be at the forefront of this technological evolution, and will continue to help our customers use IoT technology as a tool to implement laborsaving solutions which deliver high performance cleaning results.